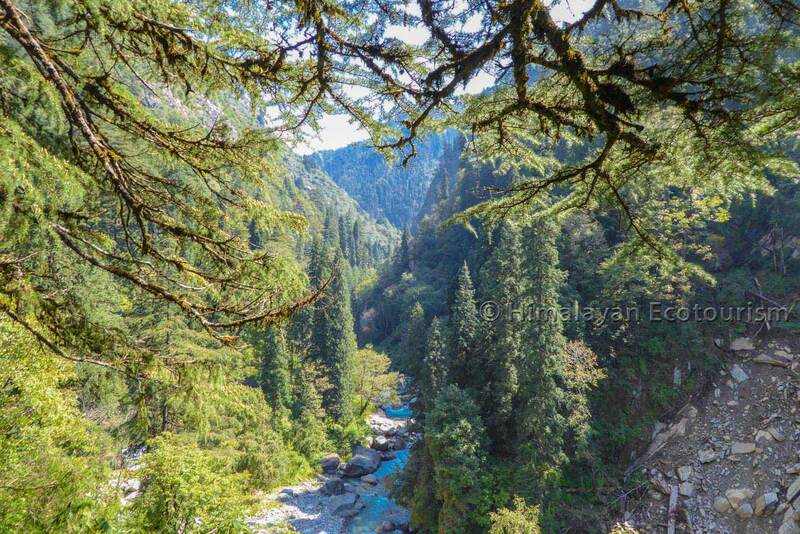 How to get to the Tirthan valley ? 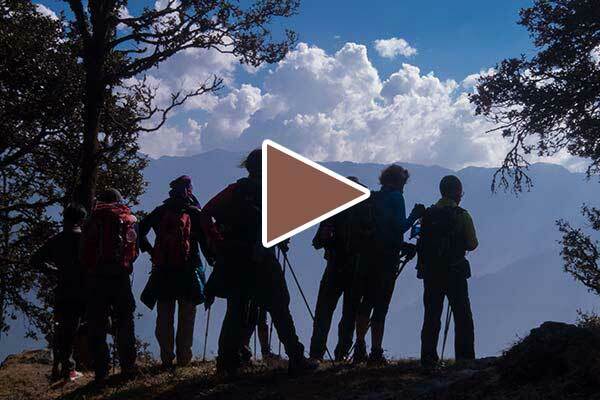 Outstanding treks for entering the intimacy of the magical Tirthan valley. Those who want to approach the Tirthan valley by car only will have a very poor experience of the place compared to those who will continue on foot after Gushaini. 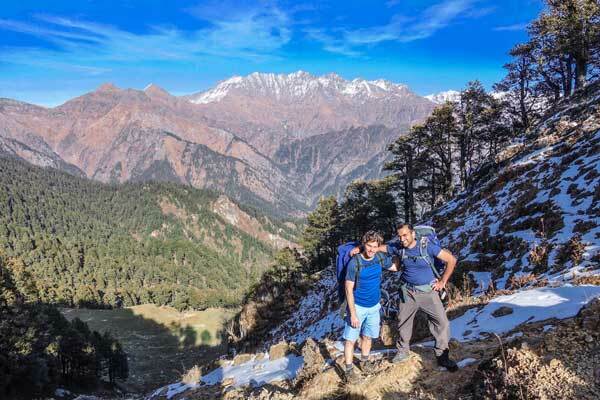 The higher part of the valley is a protected area in the Great Himalayan National Park and therefore one needs to go hiking as there is no more roads. The trek to Rolla is a very short introduction that can be extended to Shilt and Rakhundi. But in case you want to meet the real Tirthan and its wild environment you will have to go further. The next step after Rolla is called Chalocha, a small riverside campsite. From Chalocha you need to climb to a large meadow nestled in the hills above the river, Nada Thach. Nada Thach itself could be a destination which you can do in 5 or even 4 days. But you should not stop there. With an extra day you can reach a very scenic secondary top called Kobri. In case you have 3 more days, which means 8 in total, you will have the privilege to taste the water at the holy source of the river, going up to the feet of the glaciers out of which originates the Tirthan. This trek is called the Tirth (or Tirath) trek. 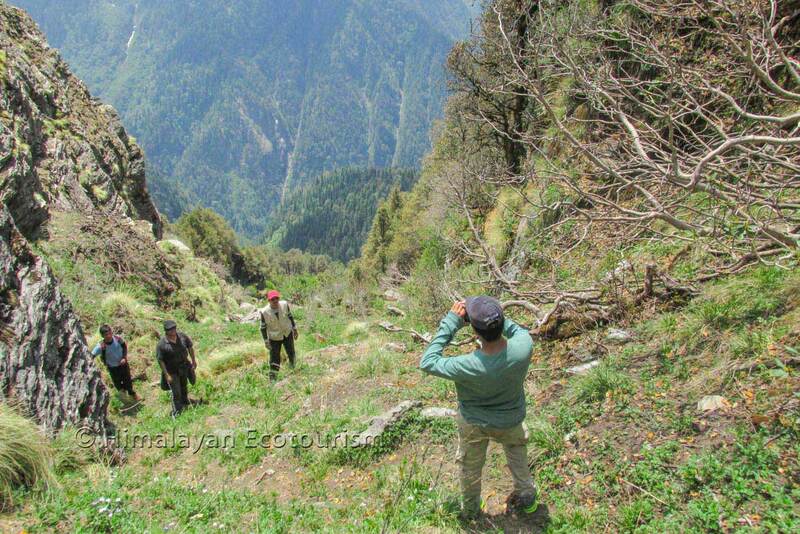 In all the cases, after Rolla, you have great chances of spotting some rare birds and mammals including the Blue sheep, the Himalayan Tahr, or even the rare Brown Bear and Snow Leopard. 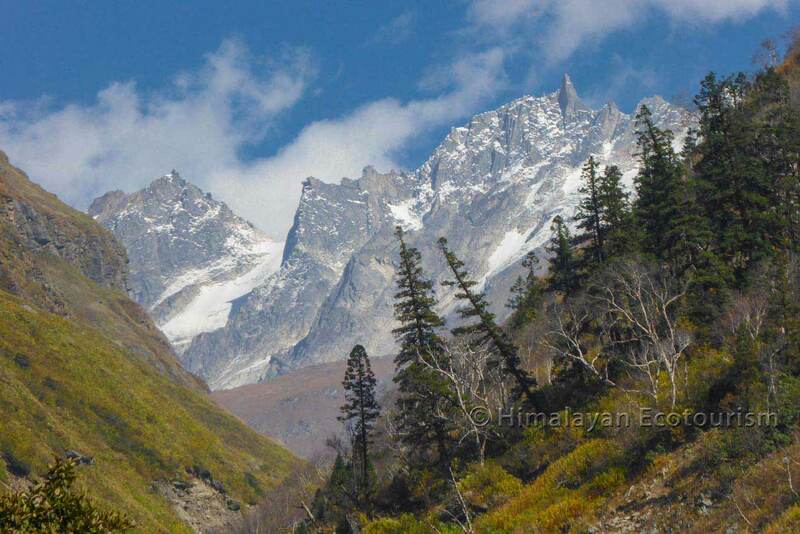 It is our promise you will get yourself amazed by the Himalayan grandeur ! 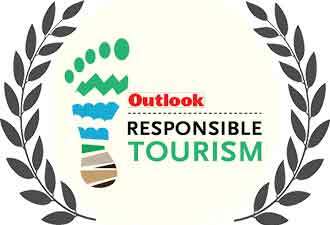 These treks do not require any special mountain skills but you should preferably have some experience of trekking. 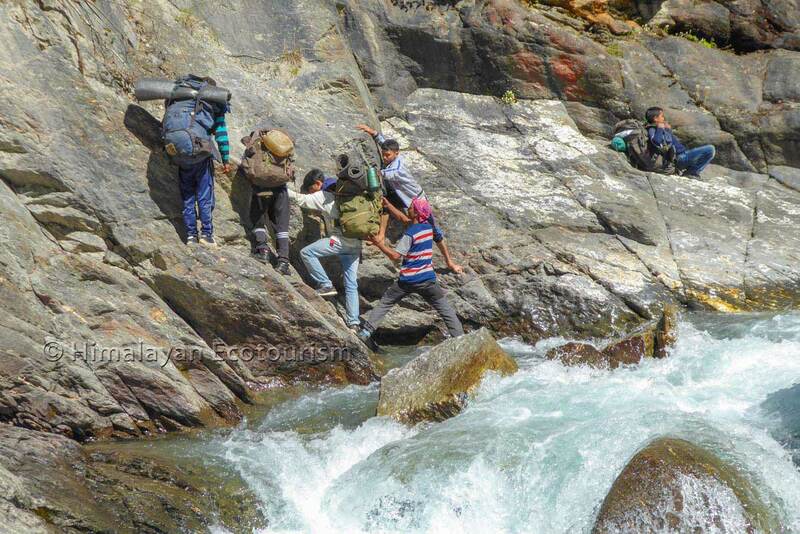 The whole itinerary of the trek follows the Tirthan river bed except for the climb to Nada. Going to Kobri is a day hike from Nada. Otherwise from Nada you continue towards Tirth. You come back via the same way. 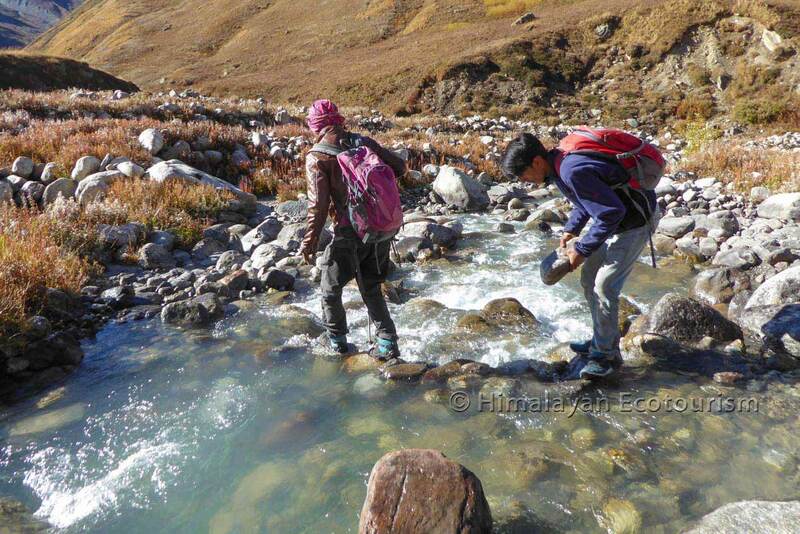 The ascent and descent of the trek is quite regular since it follows the river. The climb from Chalocha to Nada is very steep. The Tirthan valley is under the influence of the monsoon. Although you can visit the Tirthan valley during the monsoon (July to September) we do not recommend you trekking from mid-July to early September. The higher part of the valley remain covered by snow up to May and the snowfalls can start from the month of November. 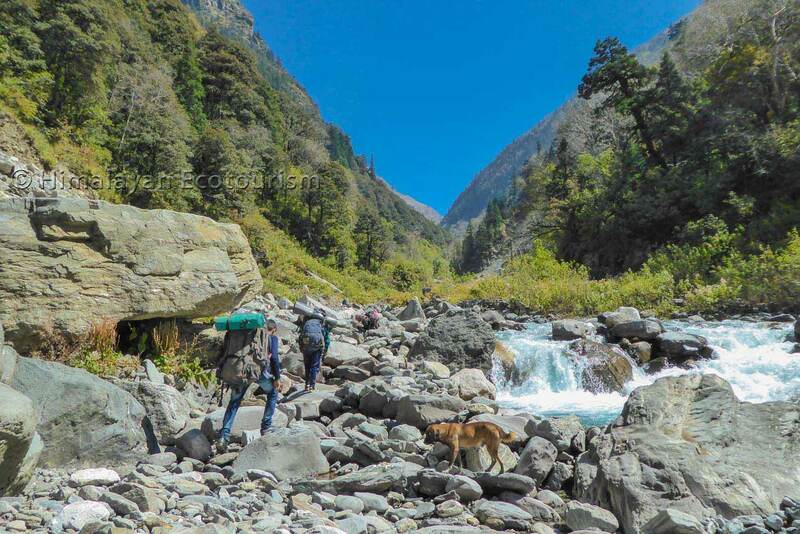 Hence the best time to trek to Kobri and Tirth in the Tirthan valley is mid-May to June, and then mid-September to early November. You may also consider early July. And if you go up to Nada only you can come from the month of April. As the trek to Tirth takes at least a week, many people ask us to reduce the number of days to the minimum while keeping Tirth or even Saketi as objective. 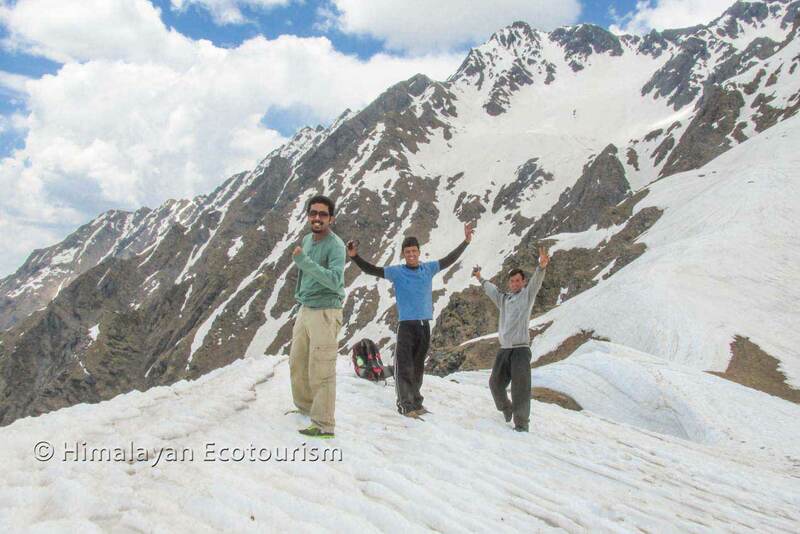 In the itinerary below we give the longuest description of the trek which can be reduced of one or two days. BUT ! You need then to take the following points into consideration. Firstly, the faster you want to go, the fitest you need to be. Don't try to reduce the number of days if you are not sure about your physical fitness. Don't hesitate to ask us for more details. Secondly, the below itinerary is also designed for the comfort of your trekking staff who has to carry all the equipment, set up the camps and cook the food. So in case you wish to go faster we will need to reward the staff for the extra effort. The alternate itineraries are given in the following section. The trek begins at the road-head Gushaini. 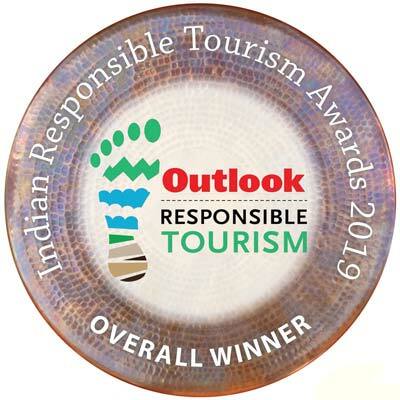 From there, you trek through the ecozone of the park and along the valley of the Tirthan river to the reach the park gate where the National Park begins. You will pass through 2 villages - Ropa and Kauncha. As your trek is in progress the human population starts decreasing and nature turns into natural wilderness. After walking for 3 hours along the Tirthan River you will reach the park entrance gate. Have your lunch before you enter the park gate. As you cross the park gate you are in the realm of Nature. On your way to Rolla, you will only come across one wood house where lives the last inhabitant of the Park, an old but very charming lady. The path will get narrower and forest will become denser. After hiking for about 45 minutes from the park gate you will reach Rolla Huts and campsite. Enjoy the company of our staff preparing you amazing food, and then spend your first night. Chalocha stage is not really mandatory since you can go straight from Rolla to Nada. But it is then a long and quite strenuous day. The classic itinerary involves a stay at Chalocha. The way to Chalocha is not so obvious since it goes sometime through small bridges, wooden stairs and big rocks in the river bed. It is better to leave Rolla in the morning to reach Chalocha for lunch time. Rolla is not so interesting compared to Chalocha. It is only a 3 hours hike. You can spend your afternoon enjoying the riverside campsite of Chalocha. Many monkeys go down to the river to get fresh water from the river. We even have spotted the Common Leopard at Chalocha. Don't worry they do not attack humans. Enjoy your time, and get always ready with your camera for the unpredictable event. Have a comfortable evening with a good bonfire. Chalocha is definitively an awesome forested spot by the riverside. There will be no transition today. From the river you have to climb a very steep trail winding in a dense forest. What an amazing feeling to get yourself at a higher altitude very fast and make the higher peaks of the GHNP out through the branches of oak and cedar trees. Have your lunch after 2 hours of climb. It will take you about 3 more hours to reach Nada thach. After having climbed 1000 m you finally reach a more or less flat area, a large high altitude meadow, Nada thach. That is when you can observe the scenery around. The meadow is large, surrounded by beautiful forests and open to the higher part of the valley. You will love it. The today's camp will be set up here. Nada Thach is the basecamp for the hike to Kobri (the scenic top above the Tirthan valley) and an important step on the way to Tirth (the sources of Tirthan river). Follows the description of Tirth trek. For today we have a relatively long but lovely trekking day. After having climbed so much yesterday you enjoy some nice descent towards the river again. The trail is not easy. Every year it suffers from landslides and it is poorly maintained, so you progress slowly. But what an adventure ! 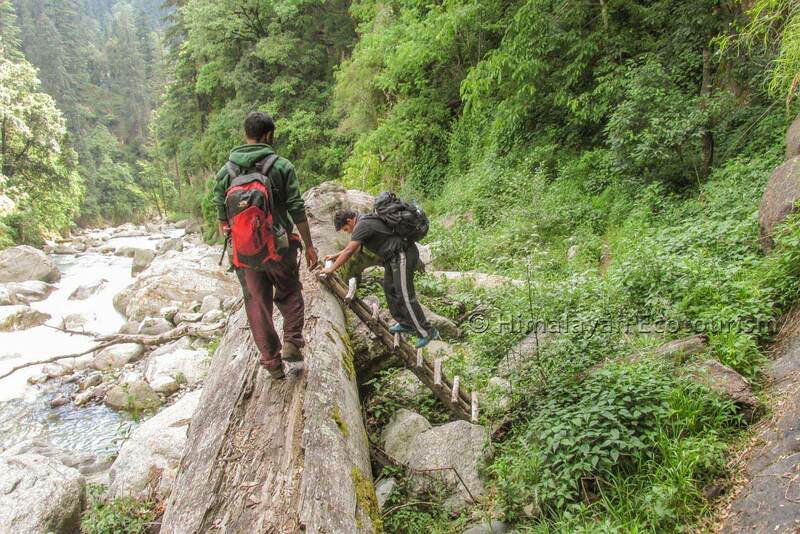 After reaching the Tirthan river again (at a much higher altitude) you continue following the riverbank. The landscape gradually changes. As far as you progress you enter the realm of higher altitude ecosystems. Between two steps, keep your eyes open, the place is very wild and may offers you great opportunities for seeing large mammals. Majhoni is reached in the afternoon. Spend your evening in this very special environment and feel the excitment of approaching Tirth ! You will be full of energy today as the motivation to reach Tirth is huge ! The natural energy of the valley helps even more ! Do not forget that you are in a part of the Himalayas which is so much respected and venerated for centuries ! This morning you cross the treeline. No more forests but bushes and then high altitude pastures. Try to reach the Tirth hut for your lunch, so that you have complete freedom in the afternoon. After your lunch, the best place to go is called "Saketi", a sacred place from where the Tirthan river originates. It is a large swamp covered with wild herbs & flowers and on which the river waves beautifully. The scenery is absolutely magnificent. The peaks around Tirth are all above 5000 m and carry huge hanging glaciers. The place is also known for its population of blue sheeps, Ibex, Himalayan Tahr and Snow Leopards. Enjoy ! Before the sunset you need to be back at the Tirth hut where the staff has set up the camp and prepared your snacks and diner. You pack up everyting after breakfast and go back on the same way toward Nada Thach. You won't have enough time to reach Nada today. Just before the climb to Nada there is a cozy campsite by riverside, Shankha Thach, where you will spend the night. Today you will have a choice of two different ways to reach Chalocha. The "normal" way goes via Nada Thach again. This involves a climb before going down again to Chalocha. The other way is a shortcut that remains by the riverside. The logic would tell that the riverside is the best option, but the trail is quite uncertain and have some difficult streches. Not sure about your ability to deal with exposed terrain ? Opt for Nada. Climb to Nada where you can have you lunch. This last day will take you directly from Chalocha to Gushaini. In the morning you will reach Rolla where you can have your lunch. Last descent upto Gushaini. You will be taken to your guesthouse/homestay when you reach. The classic itinerary to Nada Thach takes 5 days. An excellent introduction to the GHNP. Very good choice for birders. Day 1 From Gushaini to Rolla. Day 2 From Rolla to Chalocha. Day 3 From Chalocha to Nada. Day 4 From Nada to Rolla. Day 5 From Rolla to Gushaini. A must-see scenic point if you can afford one extra day. The Kobri extended route takes you to 4100 m height. Day 3 From Chalocha to Nada Thach. Day 4 From Nada to Kobri top and back to Nada in the evening. Day 5 From Nada Thach to Rolla. Day 6 From Rolla to Gushaini. Both the destination can be reached in 4 and 5 days by skipping Rolla on day 1. You must be in good shape. Day 1 From Gushaini to Chalocha. Day 2 From Chalocha to Nada Thach. In this version you save one day by reaching Nada in 2 days only. The rest of the itinerary remains the same. Day 2 From Chalocha to Nada. Day 3 From Nada to Majhoni. Day 4 From Majhoni to Tirth (+ Saketi). Day 5 From Tirth to Shankha. Day 6 From Shankha to Chalocha. Day 7 From Chalocha to Gushaini. This is done in expedition mode. Experience required as it involves very long hiking days and crossing difficult terrain. Day 2 From Chalocha to Balu or Shankha. Day 3 From Balu or Shankha to Tirth. Day 4 From Tirth to Shankha. Day 5 From Shankha to Chalocha. Day 6 From Chalocha to Gushaini. You can combine both Kobri and Tirth in 8 days. Be careful as for this itinerary you need to be pre-acclimatized to the altitude. Day 3 Day hike to Kobri. Stay at Nada. Day 4 From Nada to Majhoni. Day 5 From Majhoni to Tirth (+ Saketi). Day 6 From Tirth to Shankha. Day 7 From Shankha to Chalocha. Day 8 From Chalocha to Gushaini. 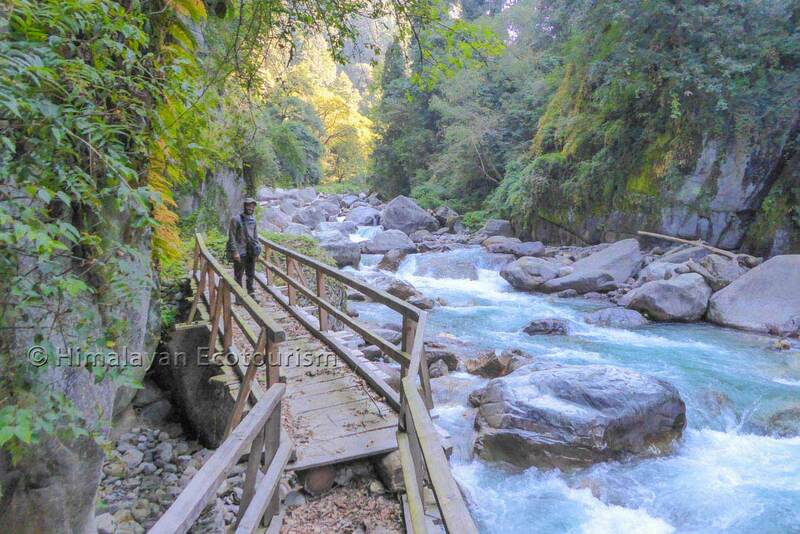 You continue the gentle ascent of the Tirthan valley by the riverside. The bed of the river is sometime the only way available. It gives you a feeling of adventure ! Before reaching Chalocha the forests are simply amazingly pristine ! 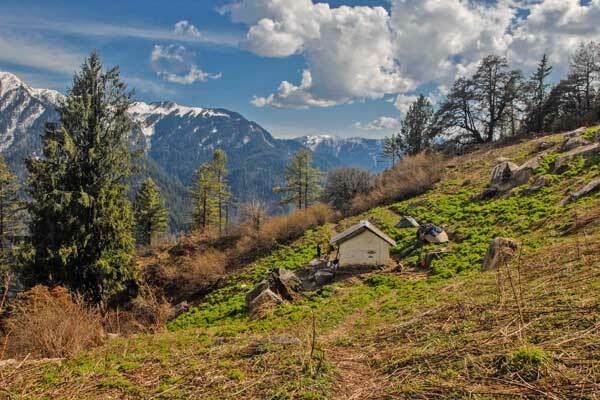 It takes only 2 hours to reach Chalocha from Rolla, a very small and charming campsite. 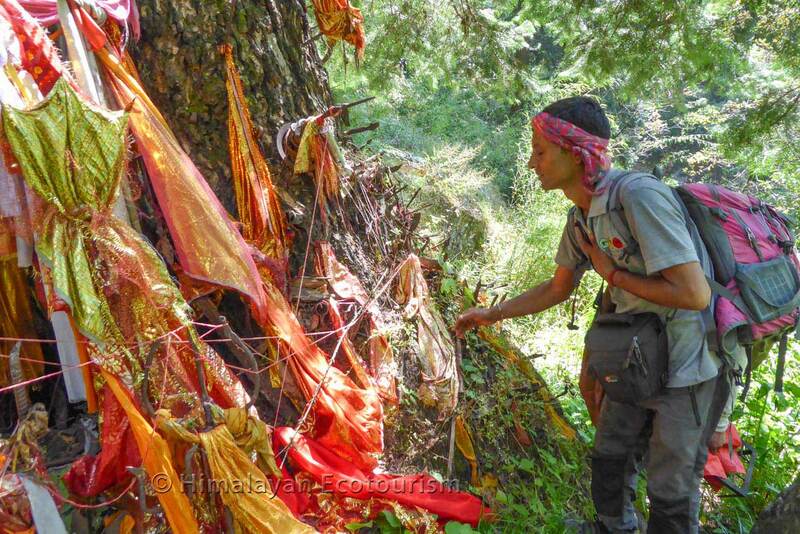 Despite the remotness of the valley the locals worship the deities dwelling in the forests! At 3300 m height, Nada Thach is a required step to either Kobri or Tirth ! While climbing to Kobri the forest gets clear and let you observe the sceneries and wildlife. Around Nada thach the wildlife is abundant. 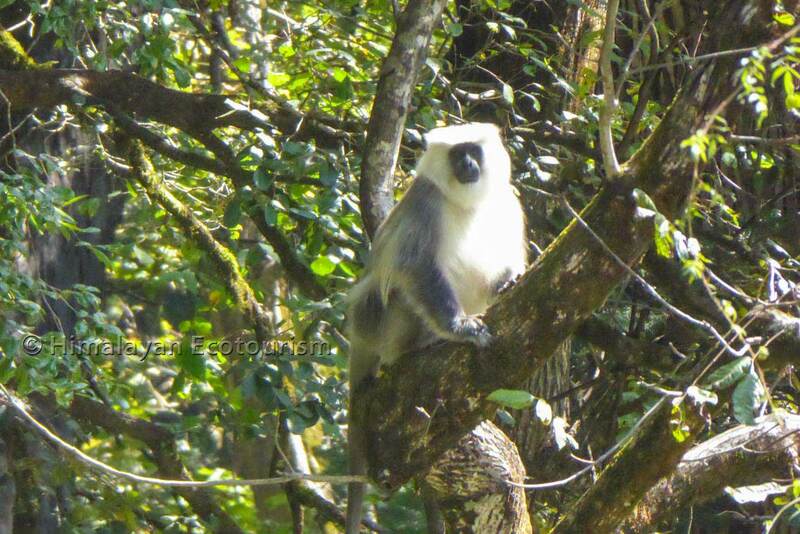 The Langur monkeys are commonly found there! 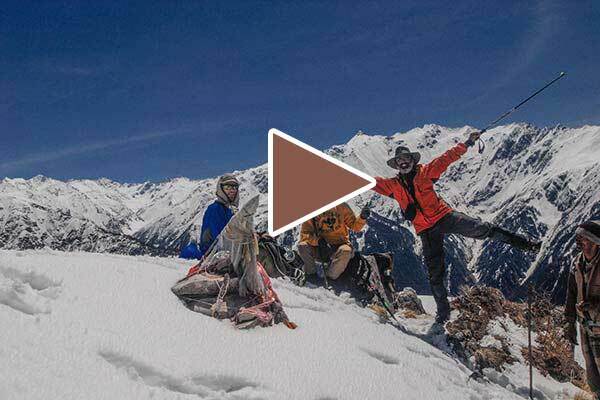 Above 4000 m, Kobri offers a great view of the valley and is often snow-covered ! After Nada Tach the path is winding down to the Tirthan river. The shortcut via Balu is shorter but quite dangerous at certain points. 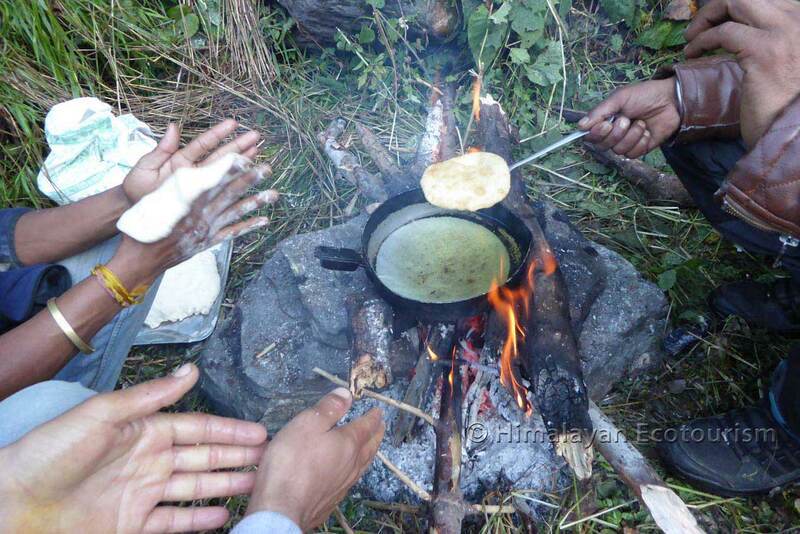 With Himalayan Ecotourism, camping and feast in the wild are always synonyms. After Majhoni you gradually enter another world : the rocky high altitude pastures. 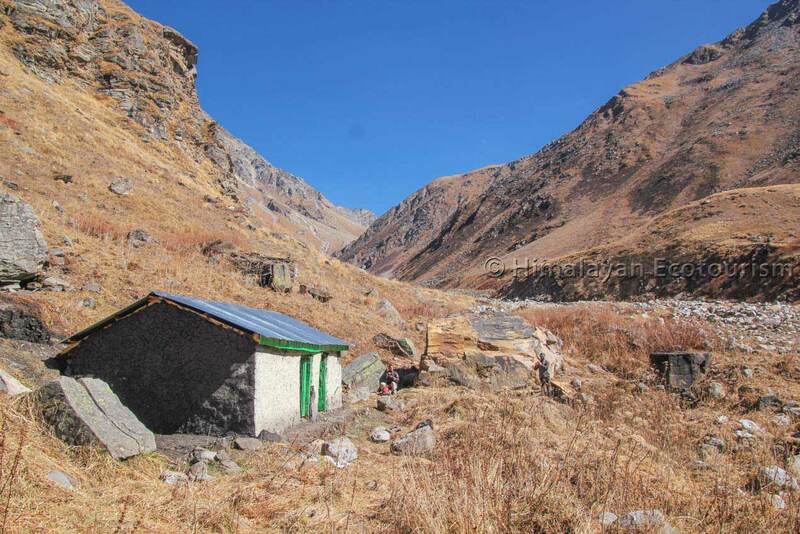 This hut is the remotest place where you will camp and from where you can hike to Saketi. 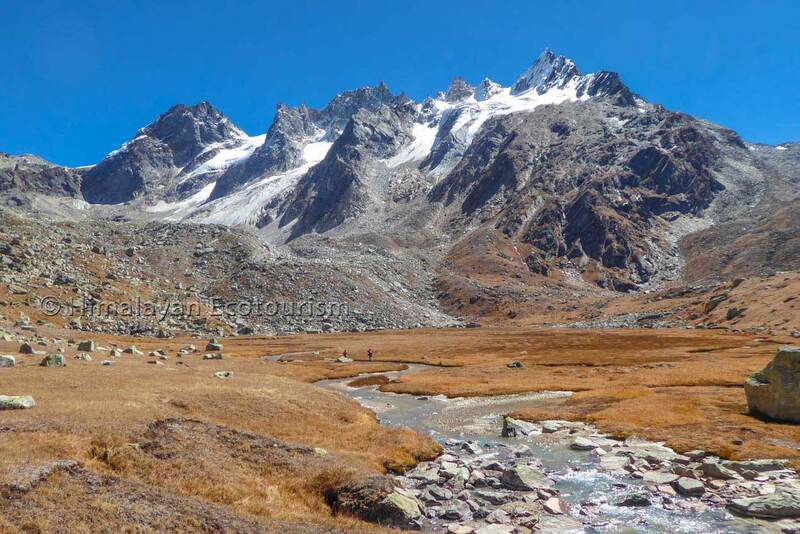 The highest meadow accessible at Tirth, 4300 m ! 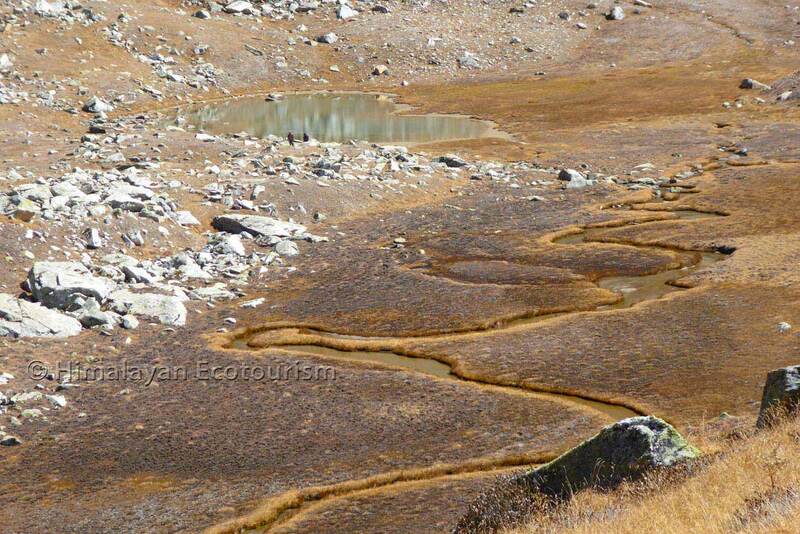 Perched at 4300m, just below gigantic glaciers, the real origin of the Tirthan river. 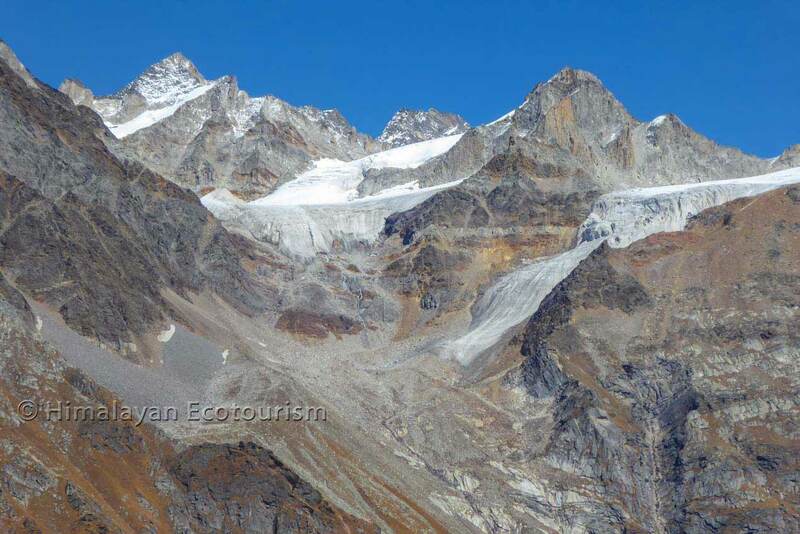 The Northern side of Tirth has huge glaciers culminating at an altitude of 5400 m! You could stay 2 nights at Tirth to have enough time to explore several valleys around. You may need/like to spend a comfortable night in the Tirthan valley before or/and after your trek. There are guest houses and homestays in the part of the Tirthan valley which not located inside the Great Himalayan national Park. We can book rooms for you in these small establishment. There are no "real" hotels in the valley and that's better. The smaller the infrastructures are, the better is your ecotourism experience. You remain far from the crowd and mass tourism ! We have selected for you the best guest houses and homestays in the valley so that you can enjoy the local hospitality and the tasty food ! Once the trek starts and you enter the Great Himalayan National Park, there are no more accommodation facilities. 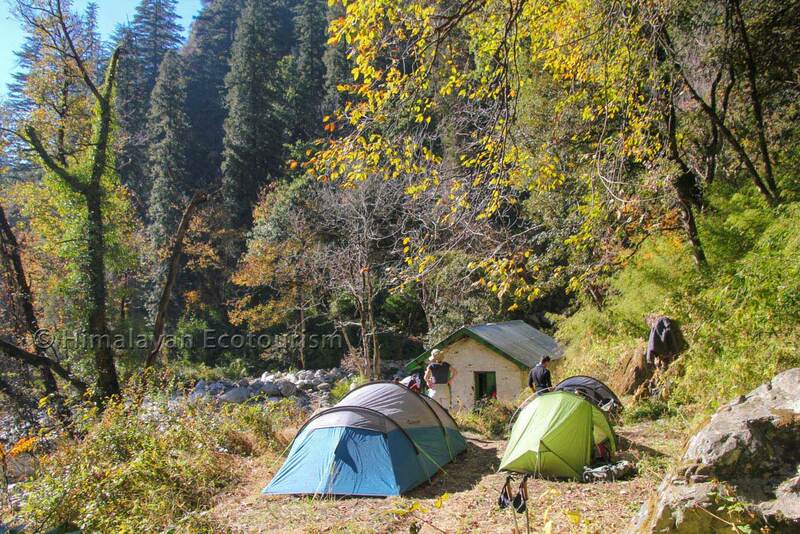 You will sleep under our comfortable tents carried by the support staff of Himalayan Ecotourism. There are no hotels but guest houses and homestays available at the start and at the end of your trek in the ecozone of the GHNP. Have a simple but comfortable and friendly stay ! The only way to sleep while on trek : under tents ! Be sure to have the most reliable and comfortable camping equipment with Himalayan Ecotourism. On the photo our Platinum camping equipment with a dining tent available on request for large groups. The Tirthan valley is located in the Kullu District of Himachal Pradesh. 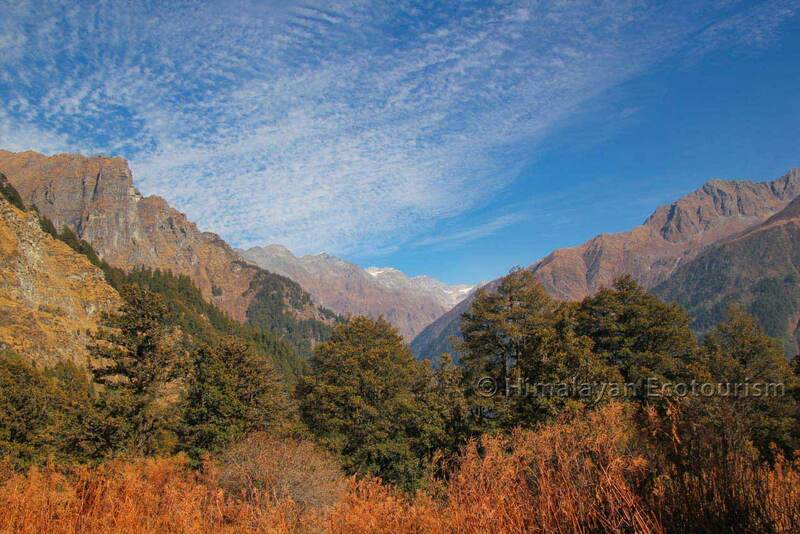 The valley is accessible from the main highway going to Manali. Most probably you will be coming to the valley by road. There is also an airport nearby (Kullu - Bhunter) but the flights are relatively expensive. The most common way to reach the Tirthan valley is to take an overnight bus from Delhi to Manali and to get off the bus at Aut. We will pick you up from Aut with our own taxi. The travel from Delhi to Aut takes about 12 hours but you can sleep in the bus (semi-sleeper seats). You will find more information here. You could also come with your own vehicle from any places in the Northern India. In this case you can follow the instructions given in the map below. This is the itinerary followed by all the Volvo buses on the Delhi to Manali line. You could follow the same route as it is the fastest. Join and follow us on Social media to get latest updates from the Tirthan Valley and the rest of the Western Himalayas.